Hardly a day seems to go by when natural flood management is not in the news. Since the December 2015 floods, there has considerable political and public support for natural flood management. Actually, natural flood management – and the Environment Agency’s involvement – has been around for years. There are many great examples of where natural flood management measures are integral to how we manage flood risk. For example, the Beam Washlands help protect over 570 homes and businesses in Dagenham. This award-winning park is able to safely store 450,000 m3 of water – the equivalent of 180 Olympic swimming pools. Another benefit was the creation and future protection of habitat for wildlife. The well-known Pickering scheme combines many natural flood management measures with a large flood storage area. Evidence shows it helped reduce the flood peak caused by the Boxing Day 2015 storms by 15 to 20%. Another successful natural flood project is the creation of a 240ha tidal flood relief area near Sandwich which – combined with an upgrade of other defences – helps protect 580 homes and commercial properties. In many places natural flood management can play a part in protecting homes and communities. However, there is more work to be done to examine effectiveness of wide-scale natural flood management measures across entire river catchments. There is plenty of evidence that natural flood projects can make a significant contribution to managing and reducing flood risk at a local level and in small catchments. More work is needed to see impact across catchments which are nearer 100km2 or larger. Environment Agency sponsored research has suggested that extensive floodplain tree planting and river restoration in the New Forest (for example in 20–25 per cent of the total river length) could result in a reduction in flood peak height in Brockenhurst by up to 20 per cent. 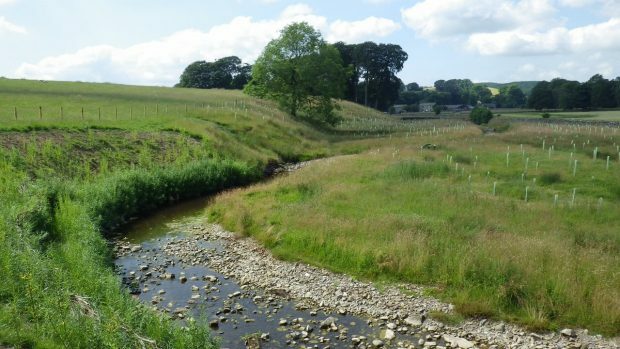 Recent work on the potential impact of natural flood management in Cumbria concluded that large-scale planting of deciduous trees at key locations could significantly reduce flood peaks. Yet one of the most comprehensive reviews of the science of natural flood management concluded that there will always be extreme floods such as Storm Desmond which overwhelm us. While natural flood management can help, it is certainly no silver bullet for the problem of flooding in every case. So what are local communities meant to make of this? This is why over the last 18 months, the Environment Agency has been carrying out its own comprehensive review of the science behind natural flood management. The ‘evidence directory’, which will be published later this year, takes an impartial look at the flood risk benefits that might arise from a range of different natural flood management measures, identifying what we know, and what we don’t. More important will be the comprehensive catalogue of actual natural flood management schemes – what was involved, how they were implemented, and what flood risk benefits they achieved. Natural flood management in action – not just models. Although the flood risk benefits of natural flood management I am sure will continue to be subject to much research and debate, reducing flood risk is not their only purpose. They can also significantly improve local environments by creating wildlife habitats, reducing pollution in rivers, creating recreational space and even increase property values and economic potential. However, there are many places were natural flood management is not the solution. Often hard engineered flood defences are needed to reduce risk. We need to consider the evidence for each catchment to decide approach, or we could be searching for the natural flood management equivalent of the Holy Grail. Instead, maybe we should focus on what we do know works, where we can help communities manage flood risk, otherwise people’s life’s and livelihoods are at stake. Natural flood management associated with smaller events at a local scale can be best. This is the approach proposed at Lustrum Beck where a cascade of flood storage ponds will support and supplement our engineered defences and will help make them more resilient to climate change. A well-balanced article although more could have been made of the multiple benefits already demonstrated by schemes. Flood risk engineers, in my experience, need to look MUCH harder fo potential multiple benefits (and hence possible funding). Lustrum beck is restricted by A177. Pickering beck blocked by fish farm sluice etc and near Vivers mill. Please call our Incident Line to report this. The line is free of charge and open 24/7 .